Wooly World Video Slot. Prehistoric Creatures. Big tusked, shaggy mastodons, flint axes and a cheery looking caveman set the theme for River Belle Casino's latest 5 reel, 20 pay-line video slot, WOOLY WORLD which takes players back to a really cool period in time - the Ice Age - through an equally cool game. 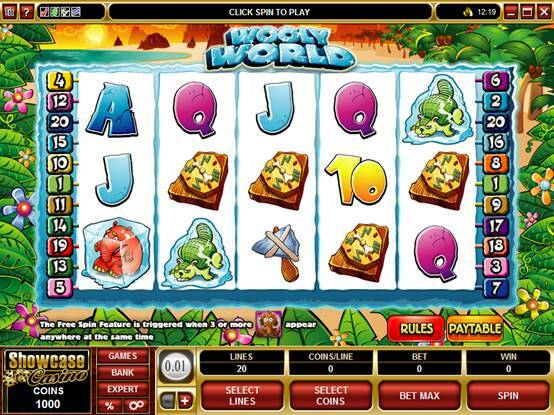 The brilliantly colored, cartoon-style graphics on Wooly World set an ages-old scene where Wild and Scatter features help the player to reap rewards and gain access to generous Free Spins and Multipliers, all capped with a Gamble feature where the correct prediction on color and suit can double or quadruple wins. 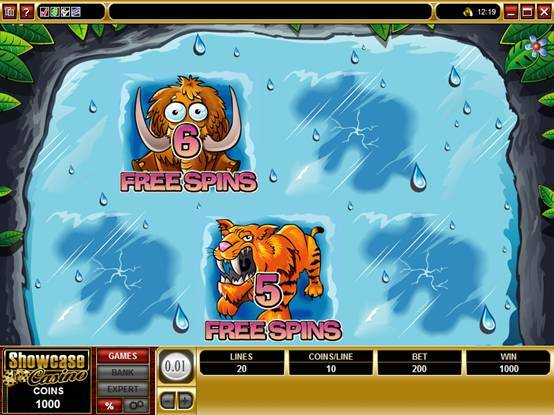 When the happy Wild Caveman appears on reels 2 or 4 it's an opportunity to build winning combinations where all wins are quadrupled, but the wooly mastodon who acts as the Scatter is the real road to riches, as three or more of these symbols open up the Free Spins selection screen. Here, the player is confronted with the opaque face of an ice block in which 5 vaguely seen comical animals are entrapped. The trick is to pick the three that will yield the biggest number of free spins - up to 15 are available and this feature can re-trigger even more freebies. Once the Free Spins are delivered its thrill-time as the player watches rewards build....and in Free Spins these are all doubled. Wooly World is sure to keep players entertained with its mixture of comical critters from pre-history and fun, video slot gaming entertainment. Players can bet as little as 0.01 or as much as 0.25, with a maximum bet of 50.00 that makes some pretty spectacular rewards achievable - 50 000.00 in the base game and a very significant 100 000.00 on Free Spins. Wooly World is set to become a classic in online slots, so take a trip back in time today and visit River Belle Casino to try it out. River Belle No deposit slots tournaments at River Belle! 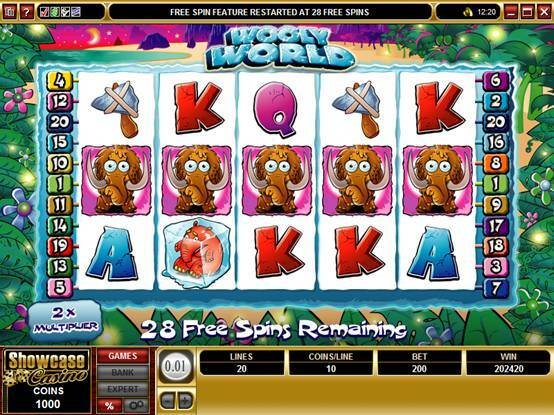 Get $100 free bonus to play Wooly World Video Slot. 400 rich graphic casino games. 200 casino games in Flash, No download required. Win cash, credits, free spins and more in our rewarding promotions!